The Symphony FDK is an OTC pricing engine which efficiently computes fair value, risk, and expected forward cash flow of derivative products. It is able to process all products from vanilla products to the most complex structures. The FDK is embedded within The Smart Quant. Furthermore, it is also deployed independently for clients with centralized or stand-alone pricing service needs. The FDK is serviced in three ways. For one, it is embedded in The Smart Quant with a corresponding pricing engine library and compatible API (C, C++, C# and Java). The client installs the FDK on their servers (Linux or Unix) and accesses the interface without limit through the API. Software as a service (SaaS) is the second method, in which the client is able to access the FDK within the Symphony Data Centre through the same API. The user registers at www.SymphonyG2.com and freely accesses the FDK without the obligation of installing the software. This method offers the FDK's updated calculation models and comprehensive market data, as well as the grid computing service at minimal cost. Finally, we also offer the full, stand-alone FDK DLL version which runs on Windows. This program generates a customized library, and the user may alter the source code for optimal usability and efficiency. With the application of the generic payoff condition, template, and description language, the FDK generates computations for any complex financial structure. The FDK supports the API of multiple programming languages such as C, C++, C#, Java, etc. and is compatible with the interface of Linux, Unix, Windows and other proprietary or third party systems. The FDK allows the user to access and examine the stages of the valuation process and pricing engine through the online platform. Clients are able to retrieve all pricing inputs including modeling assumptions, calibrated model parameters, product cash flow conditions and market data, at any time. FN Pricing Inc. (invested by ITS Company) is one of the four valuation service firms licensed by the Korean Financial Supervisory Service, providing evaluation services for hundreds of financial institutions. And for clients, the expertise of engineers and Quants providing reviews, analyses, design and modification support are available 24 hours a day, 365 days a year. The FDK is the most optimized pricing engine to date; its predefined engine call messages handle the introduction of new structured products without the need for additional development work on the engine. It also contains a comprehensive library of models as well as calibration and numerical methods. 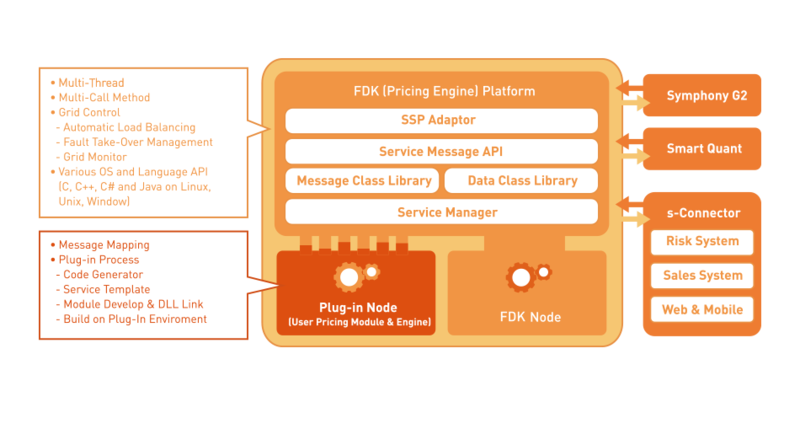 The FDK runs on the grid platform in which the user or third party pricing engine can be plugged. The user is able to streamline company processes as the FDK handles all front to back office tasks.